I’m not that type of person. And most of all, you haven’t told me about Hasselback zucchini because I’m the one who should tell you about it. Not to mention that they're so delicious, it would just be mean to deny you of this succulence. 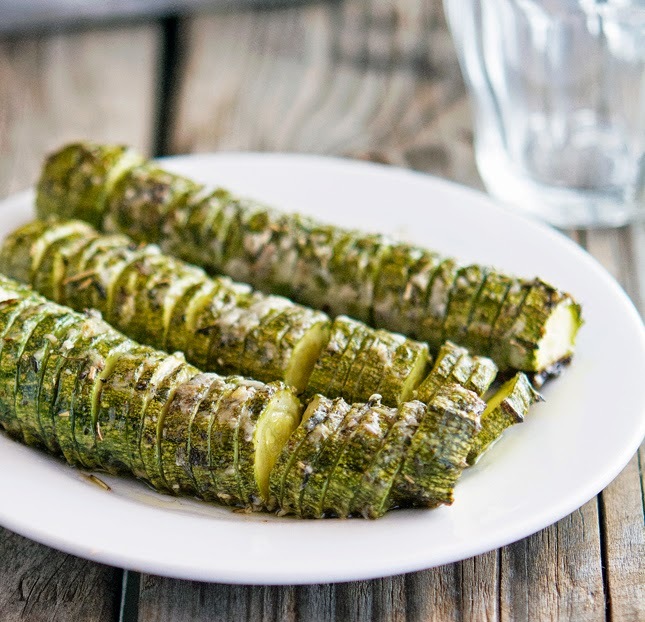 Making Hasselback zucchini is fairly simple: as with Hasselback potatoes, the recipe starts by scoring the zucchini (whether large, medium or small) with thin slices, ¾ of the way through the zucchini. I recommend setting a wooden chopstick on either side of the zucchini, as it will keep your knife from cutting all the way through. Then, after fanning the slices out gently, you dot with roasted garlic thyme butter and then pop them in the oven to roast. Just before they’re ready, sprinkle some grated Parmesan cheese on top — because zucchini and Parmesan go together like bacon and eggs. During cooking the fat gets into all the nooks and crannies of the zucchini, and helps it crisp up to perfection. What emerges is a cooking miracle: the layers fan out into rounds of crispy bliss, soft creamy center, toppings in every bite. Each zucchini is a masterpiece and it’ll look like you’ve spent hours in the kitchen. But in reality it’s easier than making sauteed zucchini. My only concern is that I haven't made more of these in my lifetime. I’m sure you'll excuse me, I have some zucchini Hasselbacking to accomplish. As for you, you must prepare this delicious recipe tonight! 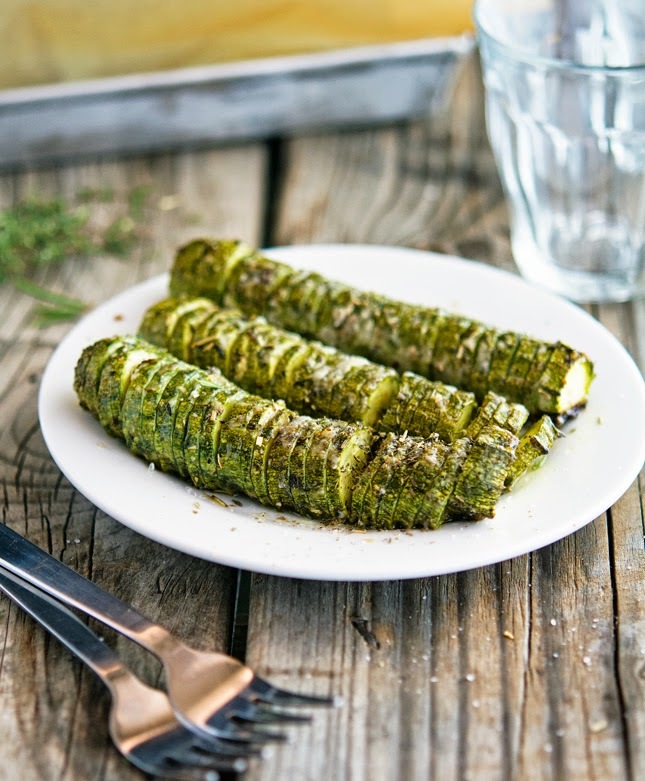 Hasselback Zucchini with Garlic Thyme Butter and Parmesan Print this recipe! One serving yields 164 calories, 12 grams of fat, 9 grams of carbs and 5 grams of protein. Good golly, Mike - so simple and SO BRILLIANT! You've been holding out on us BIG time! I could live on this alone Mike. Love how you sliced it up, looks incredible! I never thought to "hasselback" anything besides potatoes! This is such a simple yet delicious recipe idea that makes eating veggies fun. Awesome, pinning! What an inventive way to cook zucchini, loving it! Check last part of this recipe, as it calls for wrapping potatoes in foil. Should that be the zuc's instead? Do they really need to cook for an hour or was that a leftover from the potato mistake? Thanks Lisa for spotting that out, but yes the zuc's need to cook for 40 to 60 minutes, depending on their size. Hi Mike, love hasselback potatoes, never thought to prepare zucchini this way, genius!! 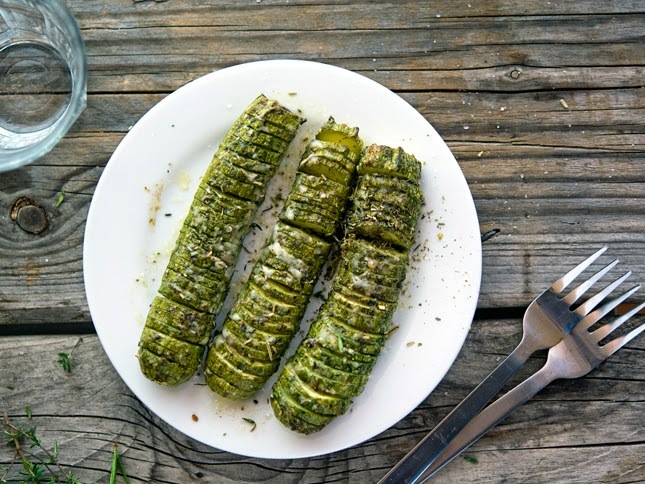 What a great idea, how did I never think to Hasselback other vegetables? Love it!!! It's a great idea!! Great flavors, and healthy, I like it! 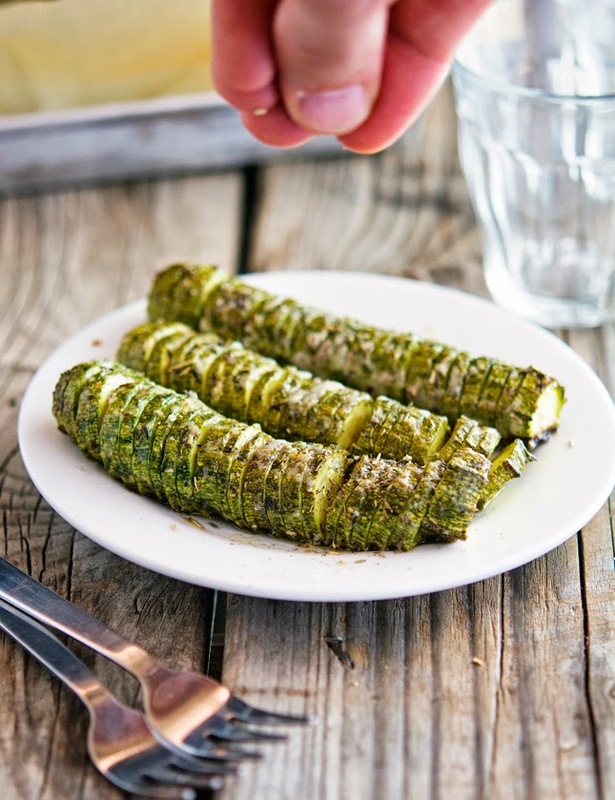 Awesome idea Mike to make hasselback zucchini's.. so much better for you than traditional hasselback potatoes which everybody seems to be making. I definitely will be recreating this recipe for my vegetarian family.. thanks for sharing it! I've never thought of making anything but potatoes hassleback! My mom makes her potatoes with rosemary and parmesan - so good!!! 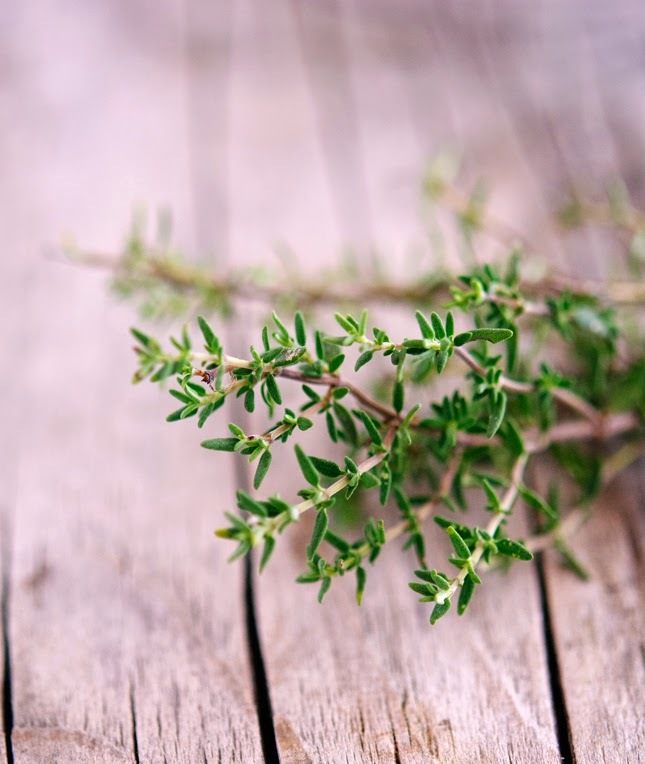 The garlic and thyme sounds perfect with the last of the summer zucchini around here, might even grill these and top with some of the butter mixture after cooking to avoid flareups! What a fun creative idea with zucchini. Just letting you know that I featured this recipe in my round-up of 25 Deliciously Healthy Low-Carb Recipes from September 2014. Hope a lot of my readers will click over here and try the recipe! Thank you so much Kalyn, that's awesome! So glad to find a low carb ( gluten free) Hasselback recipe. Looks amazing. Found you on Pinterest. I think I would love as is, or maybe a light drizzle of tomato sauce, and mozzarella on top for an Italian style dish! Either way looks yummy, but for a non low-carb crowd, might be a bigger flavor profile.